The Alcatel OneTouch Conquest proves that luxury high-end smartphone features can also trickle down to lower end smartphones. This gadget is certified water and dust-resistant and also features a scratch-resistant 5-inch high definition screen. It comes running Android 5.0 Lollipop, has 1GB RAM and 1.2GHz quad-core processor. Interestingly, the phone works with FreedomPop Wireless plans which offer irresistible plans starting from a free monthly offer. Let's find out more as we go along in the review. 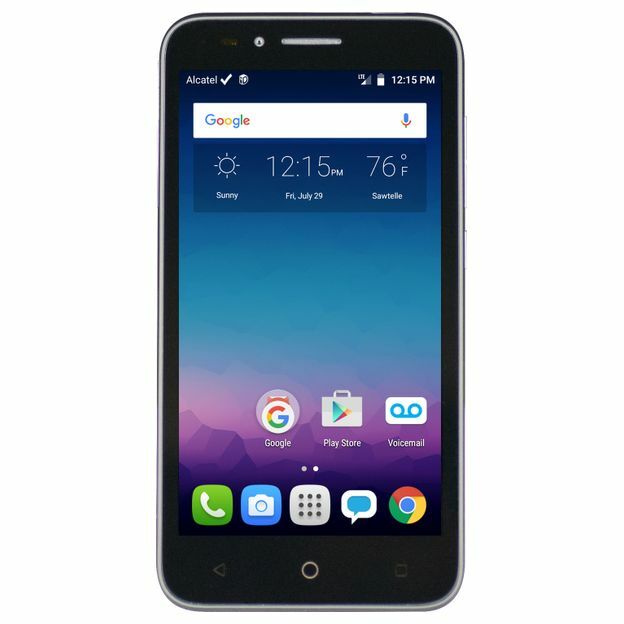 Alcatel OneTouch Conquest is available for ordering from the FreedomPop Wireless website. The packaging includes the phone, wall adapter, standard USB cable, SIM card removal tool, service guide and a quick startup guide. I quite like the exterior layout of the Alcatel OneTouch Conquest. It looks and feels nice in hand; this is because of the slightly rounded corners and the rubberized back that has a soft-touch feel to it. Similarly, the rubberized back gives a nice grip. The device also fits nicely in hand since it's only 5-inch in size. The back panel of the Alcatel OneTouch Conquest is flat, with the camera not protruding at all. This means your camera lens is not put at risk when you place your device on a flat surface. A LED flash sits below the camera. The back cover is fixed meaning the device comes with a non-removable battery. You will find your microSD and SIM slots to the left edge. The power button together with the volume rockers sits at the center of the right side, easily reachable by your thumb. The top edge hosts the headphone jack and your noise cancellation mic. The bottom of the phone hosts the microUSB/charging port and your microphone. The USB port and the headphone jack are all sealed up pretty good so as to keep the phone dust and water resistant. We have the front panel with a 5-inch display. To the top of the display, we have the LED indicator, ambient light/proximity sensor, front camera lens and the earpiece. To the bottom of the display, we have the navigation keys which light up when you are operating the phone. That pretty much sums up our tour around the hardware of the phone. The lens on the Alcatel OneTouch Conquest includes a 5MP back camera and a 2MP front/selfie cam. Of course, these are quite limited pixels, but that's what is expected on a budget smartphone. The Alcatel OneTouch Conquest does, however, have some nice features that I like. The autofocus capability is nice and the number on the top left-hand corner that represents how many more pictures you can capture based on the available storage. Another impressive feature is the ability of the camera to record high definition 1080p videos at 30fps. It does compare nicely with other phones in this price range. There's no LED flash on the front camera. However, it does a pretty good job during video calling. You may launch the camera app by swiping across the screen rightwards. The camera app is also a bit minimal and interesting. While in the camera app, you can also switch between the front and the back camera by swiping up. I found this to be a really nice feature. Settings in the app include turning the flash on or off, switching between different modes like recording and panorama. There's a 5-inch HD IPS display on the Alcatel OneTouch Conquest. This is another major selling point on the phone. The screen came out incredibly sharp and bright. This is a 720p with a resolution of 1280 x 720 pixels. With an ambient light sensor present, the screen’s brightness will auto-adjust when the lighting in the surrounding changes. The screen offers more than that. It has a Dragontrail glass that gives it scratch resistance and durability. Given that a phone's screen is the primary input and access to its features, I totally appreciate a company that considers strengthening their phones' screens. The Alcatel OneTouch Conquest gives a decent battery life. The 2500mAh inbuilt battery offers up to 16 hours of talk time and up to 12 days of standby. The screen being an IPS LCD, it's not a high power consuming one. Similarly, the phone doesn't pack power intensive resources. So, you are looking at a full day of usage, regardless of the network you are using. Alcatel had to pack a good battery since there's no option for swapping it out with a full battery. Alcatel OneTouch Conquest sports 8GB of internal storage, with about 4GB available to the user. Given the other good specifications the phone has, I found this to be a compromise. Luckily enough, the phone supports an external microSD card for memory expansion up to 32GB. Alcatel OneTouch Conquest is running basically the stock Android 5.0 Lollipop. What this means is that there's no layer or customized Alcatel skin running on top of the operating system like you would find the TouchWiz UI in Samsung phones. With a quad-core Snapdragon 410 processor running at 1.2GHz and 1GB of RAM, you are expecting a good performing device. Multitasking is pretty good. It's very easy to switch between recently launched apps, thanks to the recent apps button on the navigation. Android 5.0 Lollipop supports over a million apps which you can download from Google Play Store. I was also to play a few games which are well supported by the Adreno 306 Graphics Unit. On YouTube, I was able to play up to 720p video resolution, which felt nice. Alcatel OneTouch Conquest is 4G LTE enabled, meaning super-fast mobile internet up to 150Mbps download speeds. You may also connect to Wi-Fi hotspots and enjoy free internet. Call quality on FreedomPop is impressive plus the awesome monthly plans you will enjoy. Below follows a list of specifications. 8GB Internal Storage. Supports external memory expansion up to 32GB with a microSD card. Battery: 2500mAh Nonremovable. Talk time up to 16 hours. Standby time up to 12 days. Sensors: Accelerometer, compass, proximity/ambient light. Hearing Aid Compatible M4, T4.